On Wednesday, I will start a new job. It's hard to believe that I've not been employed by someone for almost 2 years to the day. I got laid off due to my previous employer retiring and had decided to take the summer off. Well, 2 weeks later, we found out that I was pregnant. It turned out to ne a blessing in disguise since I ended up being quite sick throughout my pregnancy. I'll be doing Accounts Payable and general office work at a (somewhat) local store. It'll only be part-time, 3 days a week so I will still be able to spend plenty of time with Keira. It also means I'll need to get things on a real schedule and stick to it. I've tried so many times and failed miserably. This time, I took several ideas from Pinterest and made my own command center. It has a calendar, chore chart, dry erase and menu. I cut a couple file holders and stuck those up to catch bills and papers that need attention. 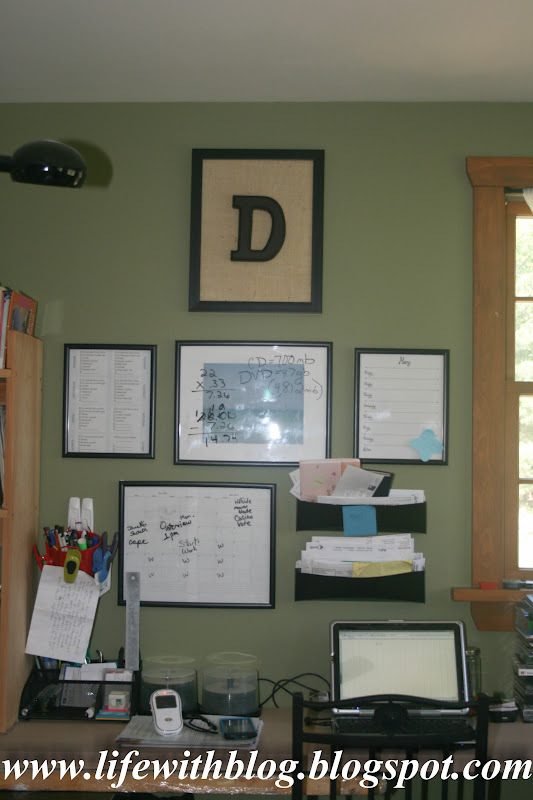 I painted a wooden "D" and attached it to some burlap (I know the D was cut crooked. Don't judge.) And I hung a bucket for pens & dry erase markers and stuck a few magnets to it. I plan to add a magnet board soon. -ish. I'm hoping this will help to keep me organized.